Additionally, there is Ryedale MP John Greenway who has been left seatless, having lost out in the race with Anne McIntosh for the newly drawn Thirsk and Malton constituency. This all means that as of now only 163 existing Conservative MPs are set to seek re-election (taking into account the fact that John Bercow will now contest Buckingham as "Speaker seeking re-election", and that by-election victors Edward Timpson and Chloe Smith will be seeking re-election). Here is the post from last month containing the responses of Conservative MPs to ConHome’s letter seeking an indication of whether they intended standing again or not. Anyone who announces their intention to retire after midnight tonight will leave their association with a shortlist of three being imposed upon them. It's probably best to use real local people in campaign literature! "A Tory parliamentary candidate has been caught using a member of staff to pose as a constituent - in an election leaflet calling for honesty. The newsletter - titled 'Honesty on the Economy' - features prospective MP Jacob Rees-Mogg talking with a blonde woman on the streets of the Wansdyke constituency, in North-East Somerset. The caption, also used on the North East Somerset Conservatives' website, simply refers to 'Jacob talking to a lady in Midsomer Norton'. However she is in fact Fiona Tyrrell, an employee from Rees-Mogg's London-based investment firm, Somerset Capital Management LLP." Mr Taylor was a committed churchgoer and Tory MPs with Christian backgrounds joined the public praise. Mark Pritchard MP commented: "David was a true Parliamentarian. He was hard working, independent-minded, always on his feet in the Chamber, and was a real champion for pro-life and animal welfare issues - amongst the many other campaigns he fought so valiantly for. David did not shrink from his beliefs - even with the onslaught of fads, fashions, political correctness, and the Labour whips. He also held a deep Christian faith. He will be greatly missed by all who knew him. My thoughts and prayers are with his family and friends at this very sad time". Nadine Dorries MP Twittered: "MPs phones buzzing with sad news re death of David Taylor MP. A man of principle with whom we all got along. Thoughts are with his family." Mr Taylor was due to stand down at the next General Election and local councillor Ross Willmott had been selected to defend a projected Labour majority of 4,477. It is probably in Labour's power to delay the by-election so that it is not held until the General Election. Today's Aberdeen Press and Journal carries news that the Conservative PPC for Moray, Douglas Ross, has stepped down from the coalition of Independents and Conservatives running Moray Council because he felt unable publicly to support all that it was doing. Douglas - who will be standing against the SNP's Westminster leader, Angus Robertson, at the general election - remains a councillor, but his departure leaves the administration in a minority. “This is not a decision I have taken lightly, but over recent months I have found myself disagreeing with some of the decisions taken by the administration. “A recent decision concerned flooding at Garmouth and Kingston. I have been raising this issue in the flood alleviation sub-committee and with officers and I am clear that short term measures need to be put in place now to protect these communities from flooding and the misery it brings. Despite my arguments the administration group felt that it could not allow a budget for these communities to be included in the report at Policy and Resources committee last week due to the financial pressures placed on the council. "I appreciate the need for financial stringency in these difficult times - and, after all, the financial mess the country is in is hardly the fault of Moray Council. But I feel I have to put the needs of my constituents first and to have the freedom to speak out to propose alternative solutions." Candidates have recently been selected for the two St Helens Seats. St Helens North - Paul Greenall A West Lancashire Councillor, where he is Portfolio Holder for Street Scene Management. Maria Caulfield - recently in the final six for Gosport - has now been selected to fight Caerphilly at the general election. Maria has been a councillor in Brighton and Hove since 2007, when she gained a seat from Labour, overturning a 1,500 majority in the process. She is now Cabinet member for housing in Brighton and Hove and cites a particular interest in environmental issues. She also works part-time as a cancer research nurse at the Royal Marsden Hospital. "I feel very proud to have been chosen as the Conservative Parliamentary candidate for for the wonderful constituency of Caerphilly. I have been made to feel so welcome by the association and I have pledged to them that I will do my very best to represent them." Her Facebook campaign page is already up and running. The seat has been in Labour hands since 1918 and the current MP, Wayne David, will defend a notional majority of 13,517 over Plaid Cyrmru, with the Conservatives starting in third place with 14.7% of the vote. Two selections from the last few days that we have not yet registered took place in Tameside in Greater Manchester. Firstly, Rob Adlard has been selected to challenge ex-Cabinet minister James Purnell in Stalybridge and Hyde. Manchester-based Rob - originally from the North East - is 34 years old and a freelance violinist. He is also chairman of the Longendale ward Conservatives in the constituency, where he would need a swing of 12% to overturn Purnell's notional majority of 8,455. Meanwhile, Seema Kennedy has been chosen to stand in Ashton-under-Lyne, where Labour MP David Heyes will defend a notional majority of 13,199. She resigned as chairman of St Albans Conservative association after her attempt to deselect Anne Main failed earlier this year. Each week a different PPC provides us with an insight into life as a candidate and gives us a flavour of their own campaign and interests. This is the last Diary of 2009 but if you are a candidate and would like to be featured in the New Year, please email Jonathan Isaby. This week's diary is written by Steve Baker, who was selected on 31st October for Wycombe in Buckinghamshire, where Paul Goodman - who is joining ConservativeHome as Contributing Editor - is standing down at the election and bequeathing a notional majority of 7,597. Steve is a professional aerospace and software engineer whose career spans the Royal Air Force and a variety of software-related businesses, and is married to Beth, a general practitioner who will shortly be leaving the Royal Air Force. Steve is an Associate Consultant to the Centre for Social Justice and Corporate Affairs Director of The Cobden Centre, an educational charity for honest money and social progress. Steve finds that being PPC for Wycombe is "both more awesome and more magnificent than opening the door of an aeroplane in flight and jumping out". We are now happily ensconced in High Wycombe, close enough to the M40 that I am developing my affinity for the M40 Chiltern Environmental Group and their aims. Aside from campaigning for Wycombe, I develop The Cobden Centre, which seeks to widen the debate on economics and society, so I spent the morning writing about the legal status of banking contracts, illustrating the peculiar status of demand deposits. After reviewing the closure of Holywell Mead pool, I met Paul Goodman MP in Parliament to discuss local issues and Wycombe Hospital in particular. As Paul said recently, "no other single issue compares to it in terms of the interest, concern and anxiety it arouses." Andrew Large has been selected for Stoke on Trent North, where he faces a projected Labour majority of nearly 14,000. James Rushton has been selected for Stoke on Trent South where he needs to overturn a projected Labour majority of 8,681. Recent LibDem defector Norsheen Bhatti has been selected for Stoke on Trent Central where the Tories are in a close third place behind the LDs in a seat with a projected Labour majority of over 9,000. In a letter to tonight's Evening Standard Zac Goldsmith has hit back at the double hits that have unsettled his campaign to defeat Susan Kramer in Richmond Park. "Politics has been reduced to a game. Rivals are smeared, voters misled, and Parliament has too many careerists for whom winning votes is an end in itself. At the next election, I will be standing against an MP who has toed the party line an astonishing 99.2 per cent of the time. Now, as a threat to this marginal Lib-Dem seat, I have become the target of an extraordinary smear campaign. I want to put the record straight. The Lib-Dems claimed I avoided “millions” in tax because of my former non-dom status, which, despite reports, I relinquished before being approached by anyone. In fact, I have always chosen to be tax resident in the UK. My father created a trust that provides me with an income. It almost all comes to the UK where it is taxed at the full 40 per cent rate. Their idea that trust ownership of my home leaves the taxman short makes no sense. When a primary home is sold, there is no Capital Gains Tax to pay. Not so the trust-owned home I occupy, if it is sold for a gain. The latest claim is that I’ve injected £260,000 into my political campaign. In fact, I have merely registered the notional use of my office and two staff over nearly three years. Life dealt me a generous hand; I chose to devote it to campaigning for what I believe in. I will continue to do so." - Zac Goldsmith, Conservative parliamentary candidate for Richmond Park and North Kingston." "Tory candidate Zac Goldsmith faced fresh controversy today after it emerged that he has spent more than a quarter of a million pounds of his own money on getting elected. The environmentalist has donated £260,000 since he was selected to fight the Richmond Park seat in 2007, according to the latest figures from the Electoral Commission... Virtually all of the money goes to office staff and “office costs”. The party says that Mr Goldsmith set up his own office in Richmond, separate to the local association's headquarters. The candidate employs two members of staff to help him campaign." I don't have a problem with that, and I can't believe anyone is especially surprised that Mr Goldsmith, who is reportedly worth £200 million, has pumped some of his own money into his campaign. Furthermore, it has all been declared to the Electoral Commission in the usual fashion and he has done nothing improper (and before any asks, he has already set the record straight on his tax status). However, what I would say is that there should never be an expectation and certainly no demand on the part of local Conservative associations around the country that candidates should be contributing a certain amount to campaign coffers. As ConservativeHome has previously reported, the costs of being a candidate already run into tens of thousands of pounds. A good candidate is not necessarily a wealthy one. A wealth of life experience working at the coalface in a sink school, with a charity, or indeed literally at the coalface can be just as valuable to the party as hard cash, if not more so. As Tim lamented just last month, when it comes to diversifying the party's candidates' list, there has been too much emphasis on gender and race and not enough on social and working backgrounds. None of that, however, is to denigrate the considerable abilities of Zac Goldsmith, for whom I will be voting as a constituent in Richmond Park next year. Whilst his views on the environment are not to everyone's taste, this Platform piece which he wrote for ConHome during party conference week makes a compelling civil libertarian case for reducing the amount of state regulation in our lives. It is well worth reading if you missed it at the time. 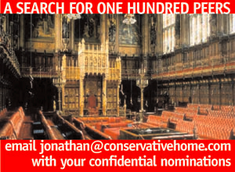 This time last year we began a search for one hundred Conservative peers. This was on the basis that if David Cameron is elected Prime Minister, he will have every right to increase the strength of the Tory benches in the Upper House, since the number of Conservative peers - 189 out of a House of 706 - is now at an all-time low, a point Tim recently re-iterated. In the first phase of the series we reached just over halfway and the list of those already nominated is below (Click here to see all the nominations). We are planning to publish the second phase of nominations in the New Year, so now we are again seeking your suggestions. As before, if you would like to nominate someone, please email Jonathan Isaby with your suggestion, ideally including key arguments for the nomination as well as biographical information. The sources of nominations will be treated confidentially where requested. Howard Flight; Richard Balfe; Charles Moore; Richard Evans; Mimi Harker; Rod Bluh; Ruth Lea; Algy Cluff; Frederick Forsyth; Robert Edmiston; Andy Street; Sir Tim Rice; Simon Wolfson; Andrew Roberts; Sir Simon Milton; Matthew Parris; Tony Caplin; Sir Desmond de SIlva; Sir Kenneth Bloomfield; Professor Karol Sikora; Brian Walden; Don Porter; Sir Graham Bright; Stuart Wheeler; Simon Mort; Lurline Champagnie; Dr Prem Sharma; Ruth Dudley Edwards; Sir Stephen Sherbourne; Patrick Nicholls; Patience Wheatcroft; Ashley Dearnley; Sir Jonathan Sacks; Edward Lister; Jill Kirby; Sir Reg Empey; John Marshall; Sir Robert Balchin; Dame Marion Roe; Stanley Johnson; Janet Daley; Mike Whitby; Nirj Deva; Dominic Lawson; Angela Knight; Sir Andrew Green; Michael Dobbs; Eamonn Butler; Stanley Fink; Michael Burleigh; Madsen Pirie. The list includes, among others, a number of businessmen, thinkers, civic leaders, former MPs and senior party activists, all with their own areas of experience and expertise. Whilst some of those new entrants to the Lords would be working peers contributing from the backbenches, there will also be those appointed with a view to serving in a ministerial capacity. We also previously included a few small-'c' conservatives whom we would not expect to take the Conservative whip, but whose world view was deemed worthy of being heard in the House of Lords. Luke Evetts has just been selected to stand in Ceredigion at the general election. "Raised in the south of Ceredigion, Luke Evetts is currently living in Penparcau, Aberystwyth with his wife. Educated in Cei Newydd Primary School before attending Ysgol Gyfun Emlyn until 18, he recently graduated with a law degree from the University of Wales, Aberystwyth. "As chair of the Aberystwyth Conservative Branch, he has also stood as a candidate for the Cei Newydd (New Quay) ward in the 2008 County Council Election, where he secured over a third of the vote. Luke Evetts is also an active member of Cadw Calon Aberystwyth, having started the successful petition to prevent overdevelopment in the historic town centre." The Ceredigion constituency has a long history of Liberal/Lib Dem representation, although was briefly held by Labour in the late 1960s and early 1970s, and had a Plaid Cymru MP between 1992 and 2005, when Mark Williams regained it for the Lib Dems. He has a notional majority of 218 over Plaid Cymru, with the Tories in third place on 12.4% of the vote. Nick Hillman was selected yesterday for Cambridge. I add my public congratulations to those Jonathan gave yesterday. Read all of Nick's tips here. All candidates in these target seats are men. Key to the Tory strategy is an attempt to paint the SNP as "ineffective" at Westminster. An internal Tory poll poll of 1,000 Scottish voters found that 74% agreed that the SNP stood up for Scotland but was not effective when it came to Westminster. "If we get a confused election result it is going to be that much more difficult to pull the economy out of recession. Scots are voting to elect a British government and the only party that can provide an alternative to five more years of Labour government are the Conservatives." Team Cameron have a high opinion of McLetchie and are considering putting him in the Lords to coordinate a Conservative government's relationship with Scotland should David Cameron become Prime Minister. Mr Cameron has already promised regular meetings with Annabel Goldie in those circumstances. Recent polling suggested that the Tories still have a mountain to climb north of the border. At an open primary meeting today, Nick Hillman was selected from a field of six to stand as Conservative candidate for Cambridge at the general election. Nick is Chief of Staff to David Willetts, specialising in university policy. Previously he worked for pension companies and, before that, spent five years as a History teacher. He has also authored a number of pamphlets for Policy Exchange, Politeia, the CPS and the Bow Group on a variety of issues including pensions, employment, tax credits and welfare reform. "Cambridge does not always receive its fair share of national resources. Only last week, it was announced local schools won’t get funding to cover the recent increase in births. So we need a local MP who will fight to put Cambridge’s interests at the heart of the next Government. I have the experience to do that..
"I have worked in local schools, including Hills Road Sixth Form College, so I know the needs of young people and public sector staff. I have lived on King Street, and I cycle, drive and use public transport, so I understand local transport pressures. I was once the victim of an unprovoked assault in the city, so I will tackle anti-social behaviour and work for safer streets. "It is because Cambridge is our favourite place that my wife and I held our wedding reception here earlier this year, and we will move here later this month. I pledge to fight a clean campaign on policies, not personalities." The sitting Lib Dem MP, David Howarth, is stepping down and will bequeath a notional majority of 5,834 over Labour to his successor as Lib Dem candidate, with the Conservatives starting in third place with 17.3% of the vote. The seat was Tory-held for all but one year between 1950 and 1992, when it was gained by Labour, who in turn lost it to the Lib Dems in 2005. Nick replaces the previously selected Conservative candidate, Richard Normington, who stood down in October. The Conservative candidate in Hove, Mike Weatherley, has received a big boost today by the defection of his UKIP opponent, Mike Mendoza (pictured), to the Conservative Party. Mendoza - who has hosted shows on a number of talk radio stations over the years - is in fact a former Conservative councillor in Brighton and Hove. However, he left the party a few years ago and has since stood for UKIP as a candidate for West Sussex County Council and Brighton and Hove Council, and was set to stand in Hove at the general election. "After talking to both Mike Weatherley and Tim Loughton [MP for Worthing East and Shoreham where he lives], I realised that they both had the same ideals as me and it would be ridiculous for me to stand against either of them. We have to work together as hard as possible to rid ourselves of this discredited Labour Government. "I am also totally disillusioned with the way UKIP has developed over the past year and I am very disappointed with the choice of new leader. Nigel Farage will be a very difficult act to follow and without him at the helm UKIP will inevitably lose a lot of credibility. "I am now going to rejoin the Conservative Party, where I believe I can make suggestions and those suggestions will be listened to. It is far better to be within the Conservative Party trying to make a real difference and only the Conservatives offer any realistic prospect of rowing back from the unashamed federalist European agenda with which this Labour Government have been complicit and which the vast majority of people in Britain do not want. "I was very impressed with Tim Loughton’s views and will support him in every way I can for the future as my MP. I have always considered Tim a very hard working MP and would not want to do anything to stop him carrying on the great work he has started and achieved so far. Mike Weatherley also has my full support and I have every confidence that he will make a first class MP for Hove." "I'm honoured to have been selected as the PPC for Orpington - a seat that has been so brilliantly represented by John Horam MP - and would like to pay tribute to the exceptional field of candidates who made it such an exciting and gritty finish. I wish them all the best - they deserve better luck than they had last night. "I'd also like to thank Association Chairman John Esler for his sterling work in organising the selection in such a compressed timeframe and to say how much I am looking forward meeting as many people as possible in the coming weeks as I get cracking on the campaign." Jo Johnson was selected at a special general meeting of Orpington Conservative Association tonight to replace retiring MP John Horam as candidate at the general election. Events took a dramatic turn when what should have been the fifth and final ballot - a run-off between Johnson and Sajid Javid - resulted in a tie, and a sixth ballot was then called in which Johnson was victorious by just one vote. A total of six finalists had appeared before the meeting, which I understand was attended by just over one hundred association members. Jo Johnson is the younger brother of London Mayor Boris and an associate editor of the Financial Times where he edits the paper's Lex column. Read more about him in his Wikipedia entry. He will defend a notional Conservative majority of 5,221. An Open Primary meeting will be held on January 22nd, for which any voter in the seat can pre-register via the local association website. The winner will inherit a majority of 9,936 over Labour. Davis Wilson has been selected to fight the Inverclyde constituency in the west of Scotland for the Conservatives at the general election. David is a local councillor and is in fact currently a one-man Conservative bloc in a rainbow coalition running Inverclyde council. He will take on former minister David Cairns, who will defend a Labour majority of 11,259 over the SNP. At the last election the Conservatives were in fourth place with 10.2% of the vote. Six candidates have been shortlisted for the forthcoming Open Primary in Cambridge, where a Conservative candidate to replace Richard Normington will be chosen on Saturday 12th December. More biographical details are on the Cambridge Conservatives' website. Any Cambridge resident wanting to register to attend the meeting must register through the association's website before midnight this Wednesday, 9th December.